Wing span: 2 3/4 - 3 3/4 inches (7 - 9.5 cm). Identification: Tip of forewing is elongated. Hindwing has long dagger-like tails. Upperside is orange with 3 thin black lines. 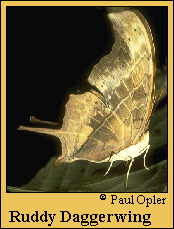 Underside is mottled brown and black, resembling a dead leaf. Life history: To watch for females, males perch 15-30 feet above ground on sunlit trees. Flight: Most of the year in Florida, but are most common from May-July. Caterpillar hosts: Common fig (Ficus carica) and wild banyan tree (F. citrifolia) in the fig family (Moraceae). Adult food: Nectar from giant milkweed in Florida; Cordia, Casearia, Lantana, and Mikania in the tropics. Habitat: Tropical lowland forests and edges; hardwood hammocks. Range: Brazil north through Central America, Mexico, and the West Indies to southern Florida. Strays north to Arizona, Colorado, Nebraska, Kansas, and South Texas. Conservation: Not of conservation concern in Florida. DeVries, P. J. 1987. The butterflies of Costa Rica and their natural history. New Jersey. 327 pages, 50 color plates.